Food delivery service foodpanda has launched a new service called Pick-Up, that allows customers to order meals on the foodpanda app or website, and pick up the orders from the restaurants. According to the company, with the new service, customers are able to avoid waiting in a queue as customers are able to pre-order food and collect directly from the restaurant in a span of 15 minutes. In addition, users of Pick-Up will not incur a delivery fee or be subject to a minimum order value. Speaking to Marketing, Luc Andreani, managing director of foodpanda Singapore said with the new service, restaurant partners will be able to “efficiently” manage food orders as well as increase the number of customers served daily. While the team is currently focused on introducing this new option on the platform both on desktop and app, the marketing team will later be brought in to raise awareness and educate users on how to use this new feature. Where do you find growth? Andreani added that since the launch of foodpanda in Singapore more than six years ago, the brand has always optimised its offerings based on the user experience on the platform. “Based on industry data and user insight we developed the Pick-Up function which helps people to cut the queues and save time. The launch of Pick-Up signifies an important step in the company’s growth strategy, adapting to the habits of our customers and embracing innovation,” he said. He added that foodpanda currently offers the Pick-Up option for more than 2,000 of the restaurants, and it will be rolled out to the majority of foodpanda’s network of over 6,000 restaurants by the end of the year. 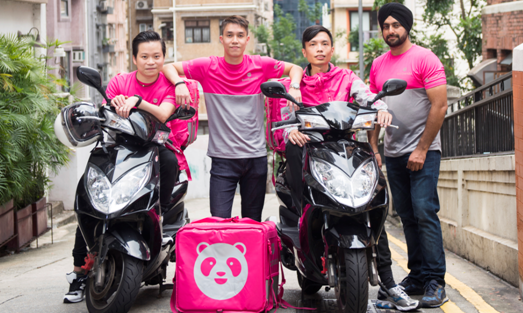 In a conversation with Marketing, Luke Lim, CEO of AS Louken Group said that given that the food delivery segment is competitive and crowded, foodpanda has a new layer of advantage with its new offering. “This is part and parcel of the continuous innovation the brand has taken to improve its traction and engagement with customers,” Lim added. To better find new revenue stream, Lim explained that brands should look in the direction of customisation via artificial intelligence (AI) . “Customisation via AI should be the direction these models head towards, so that consumers will be given suggestion from time to time. And also marketing or advertising dollar will continue to be the main stream revenue other than the transaction percentage,” he added. Graham Hitchmough, chief operations officer at Bonsey Design said that much like the ride-hailing services, the key to success for food delivery businesses is overcoming razor-thin revenues by building scale and establishing habitual behavior among consumers. “To do this, competing players must drive preference and loyalty among users by combining tech, data and consumer insights to deliver ever more valuable and differentiated offers,” he said. Simply creating promotional activity (which is largely used during the customer conversion phase), is not sustainable in the long-term, so service innovation and niche targeting will increasingly come to the fore. He added, that while foodpanda’s Pick-Up is one example of this, it is unlikely to be unique for long. As in other categories, increasingly tailored service offers will be one way to differentiate – much like subscription services that combine customization, convenience and value to consumers. Tan Sri Vincent Lee, Trapper Media Group and Sandeep Joseph have partnered up to launch Ampersand Advisory, a digital-centred cons..
Vuulr currently has endorsements from Mediacorp, PT Media Nusantara Citra Tbk (MNC), Endemol Shine Group, amongst others. .. Among the list of sponsors for the museum include Samsung, Pandora, Benefit Cosmetics, Baskin Robbins, TeaLive, llao llao and dUCk..